Before getting shots at star turns in La La Land, Dustin May and Gavin Lux will make guest appearances at Camelback Ranch. The Dodgers extended non-roster Major League Spring Training invitations to MLB.com's No. 69 (May) and 70 (Lux) overall prospects on Friday, the organization announced. This is the first spring invite for both players. May was taken out of a Texas high school in the third round of the 2016 Draft and has seen his stock rise in each season since. 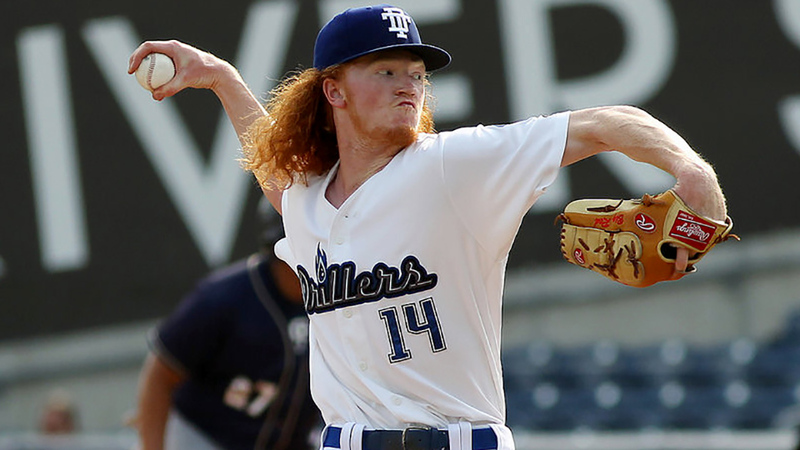 In 2018, the 21-year-old right-hander posted a 3.39 ERA and 1.11 WHIP with 122 strikeouts and 29 walks in 132 2/3 innings between Class A Advanced Rancho Cucamonga and Double-A Tulsa. The 6-foot-6 hurler has been lauded for a plus fastball that features plenty of movement, plus curveball and above-average cutter. He's walked only 4.8 percent of the batters he's faced in three Minor League seasons, and that above-average control makes his arsenal all the more effective. Lux, who was taken 81 spots ahead of May in the 2016 Draft, is coming off a breakout 2018 campaign after struggling earlier in his career. The 21-year-old left-handed slugger hit .324/.399/.514 with 15 homers and 13 stolen bases in 116 games, also split between Rancho Cucamonga and Tulsa. That came one year after he hit .244/.331/.362 with seven homers with Class A Great Lakes. Lux has primarily played shortstop during his three Minor League seasons, but also has experience at second base. His playing time at the keystone could increase the closer he gets to the Majors, due to Corey Seager's apparent lock on the big club's shortstop position. Both May and Lux are expected to open 2019 back in the Texas League with Tulsa. Other ranked prospects to finish 2018 among MLB.com's top 30 in the system and to receive non-roster invites Friday were No. 5 Will Smith, No. 8 Mitchell White, No. 9 DJ Peters, No. 15 Tony Gonsolin and No. 30 Omar Estevez. The remaining invitees were pitchers Stetson Allie, Joe Broussard, Daniel Corcino, Kevin Quackenbush, Josh Smoker and Jesen Therrien; catcher Josh Thole; infielders Daniel Castro and Jake Peter and outfielders Ezequiel Carrera, Kyle Garlick, Paulo Orlando, Cameron Perkins and Shane Peterson.